Please ask the UK Government to intervene militarily to save lives of Zimbabweans from their brutal government. 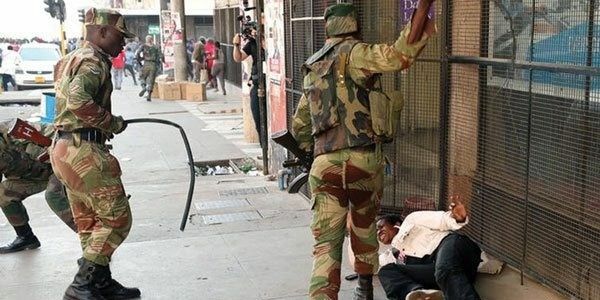 Zimbabwe was propelled into military dictatorship in November 2017, when the army toppled the then President R G Mugabe under the guise of cleansing the country of corrupt officials who had captured President Mugabe. When Emmerson Mnangagwa was installed as the civilian head of the military regime, it was claimed to be a new dispensation. Amazingly there has been unjustified brutality and killings from the army and the police as well as secret services agents. To date, not a single arrest has been made since after Elections, innocent civilians, children and pregnant women have died and tortured for exercising their legal right to demonstrate. The economic crisis has led people to the streets to demonstrate their displeasure. However, instead of listening, the regime responded with a heavy hand. More people were beaten up, brutalised, raped and some murdered. In fact the atrocities continue unabated. The actual figure of fatalities is unknown but is growing. We call upon the UK, in its capacity as the former colonial master to intervene and save lives. France intervened in Rwanda in 1994 and recently under Operation Barkhane involving 3,500 troops across Chad, Mauritania, Niger, Mali and Burkina Faso. We believe the UK has capacity to do so. Thank you.